Pop Up! Golf Prank | OhGizmo! Adding to the tradition of non-stop hilarity on the greens is the Pop Up! 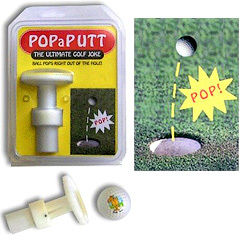 golf prank which appears to be a small spring loaded device that will cause a ball to come shooting back out of a hole after it’s fallen in. Of course you’ll need a clever distraction in order to slip the Pop Up! into the hole without anyone seeing but once it’s there you can be sure your prank will go down in the annals of golf history. The Pop Up! is available from Bim Bam Banana for $18. Oh my gosh that would hilarious.